The other day we saw an interview in which Cadillac CEO Johan de Nysschen pointed to the Youths and infrastructure as some of the reasons for the shift away from sedans and performance cars crossovers and SUVs. We disagreed, so we wrote it up. And then de Nysschen called us to explain a bit more. In the process, we discussed how Cadillac’s adaptation to a changing and very global luxury market has been a challenging one. Naturally, we weren’t buying that, so we said as much. But then de Nysschen called us to explain that, well, things are a bit more complicated than that. Cadillac’s take wasn’t just his opinion, either, he said. It was backed by extensive market research, which any company worth its salt is going to have. We at Jalopnik have disputed the idea that “the kids aren’t into cars” for years now—one need only look at the modern tuner scene, or go to a drifting event, or read this very website, whose audience has risen 62 percent in the last year alone, to understand that that’s false. Of course, an automaker like Cadillac faces different issues. One of the main ones is a mix of history and geography. The Asian market—the Chinese market specifically—has grown so much and so quickly that it came to command more of Cadillac’s automotive attention, though it’s now at more of a “self-sustaining” level that enables the company to focus more on the American market once more. And though de Nysschen didn’t say it explicitly, it’s also the Chinese market that has a voracious appetite for SUVs and crossovers, to the detriment of sedans and regular cars. Asian buyers want vehicles that can carry them “comfortably, but they don’t need to do zero to 60 mph in four seconds and a Nürburgring in nine minutes flat,” he explained. Which means that the baggage Cadillac’s been saddled with can weigh a bit more. Competitors like Mercedes, BMW, and Audi, with their extensive product lines and impressive quality levels have been developing cars for the entire world for decades, if not over a century. For more than 100 years Cadillac catered to the American market pretty much exclusively and entirely, he said, which set it back a bit. He took pains, however, to say that he wasn’t making excuses for Cadillac’s own sales performance, which slipped from a decade-high 175,267 vehicles sold in 2015 to 156,440 in 2017, according to GoodCarBadCar.net. But he did say that the future is looking up for the storied marque. Some models, like the crossovers that enthusiasts love to hate, are genuinely beloved by the car-buying masses, which means that Cadillac doesn’t really have a choice but to crank them out. But it’s not abandoning its new ideals of ridiculously, absurdly powerful performance cars. “The XT5 is doing very nicely thank you, it’s the third-best selling luxury nameplate in the U.S. after the Lexus RX, and the Mercedes C-Class,” he said. Though he did acknowledge, well, at that plastic in the CTS. It’ll take more time, and he said that there would be a huge difference in the interior quality in the next generation of the car that replaces it. “We’re on a long-term transformation program,” he added. 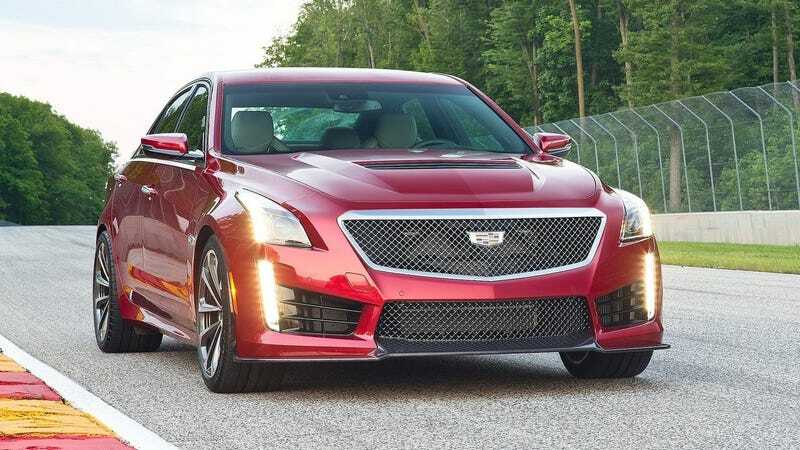 He didn’t say how long term, however, nor when the returns from that transformation would start rolling in, though one must think it had to have begun in 2002 with the debut of the original Cadillac CTS. That’s been a while, and one must imagine some at GM are getting impatient. Yet “Everything has to support that,” de Nysschen said. “The design, performance, dealer organization, marketing look and feel. But product is at the core, and therefore, some models are conceived specifically to generate broad volume, and others have a far more specific duty,” he said.